The best way to find out what someone reads is to look at their books. Here is a copy Tolkien’s The Hobbit. 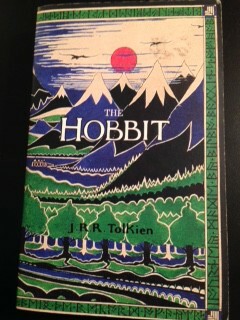 One of my copies of The Hobbit. It is such a beautiful cover–and a beautiful copy. Brand-new. I bought it for my children since my other copy I had marked up. But that doesn’t really tell you about my reading habits and those of my family. These images should give you a hint as to what we have read and how often. The magic tape on the spine of The Fellowship of the Rings is more noticeable in this image. The Fellowship of the Ring has torn edges and magic tape holding the cover on. A bit ripped and ragged. The Two Towers is looking a little worse for wear. The Return of the King. Note the masking tape holding it together. The three books side by side. These images tell you more than anyone claiming they’ve read the book a lot. Here is physical evidence of a loved and beloved book series.